You may easily own a few remote controls in your living room with each dedicated to control individual home appliances such as TV, DVD player, ceiling fan and many more, and that is how universal remote control is useful for. However, it is not always easy to program or use the universal remote control that ended up you can’t have it as a full replacement. 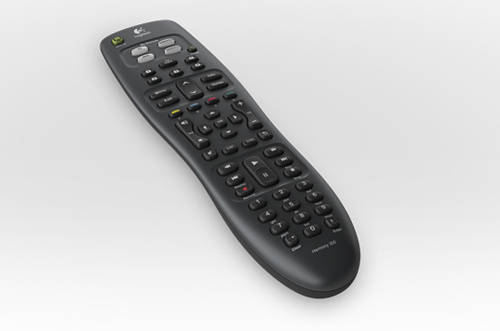 In order to address such complexity, Logitech has recently added in a new universal remote control under its Harmony product line. Named as Harmony 300 Remote, it is aimed to provide simpler home entertainment systems control while maintaining a relatively lower pricing to be affordable by public. Unlike its higher end sibling model Harmony 700 Remote that can be used to control up to six devices, the Harmony 300 Remote can support up to four devices which is sufficient for most users. And more importantly, Logitech claimed that the programming process is a lot simpler as compared to other competitors’ solutions thanks to its newly designed web based interface. What users need to do is just connect the remote control to internet enabled PC then go to browse for the correct device model through www.myharmony.com. To make it really useful, it has been backed up by online device library that contains a huge database with up to 225,000 devices from more than 5000 brands, so rest assured that you can easily find compatible IR based devices ranging from old VCR or even the most advanced Blu-ray player. At an affordable pricing of $49.99, the Logitech Harmony 300 Remote will be reaching US and Europe countries by earlier April. For comparison, its Harmony 700 Remote and Harmony One Remote are being sold at least three times more expensive at $149.99 and $249.99 respectively worldwide.